CALGARY, ALBERTA–(Marketwired – Nov. 12, 2015) - Gran Tierra Energy Inc. (“Gran Tierra” or the “Company”) (TSX:GTE) (NYSE:GTE) and Petroamerica Oil Corp. (“Petroamerica”) (TSX VENTURE:PTA), both international oil and gas companies operating in Colombia, are pleased to announce that they have entered into an arrangement agreement dated November 12, 2015 (the “Arrangement Agreement”) whereby Gran Tierra has agreed to acquire all of the issued and outstanding common shares of Petroamerica by way of a statutory plan of arrangement under the Business Corporations Act (Alberta) (the “Acquisition”). Gran Tierra believes that the acquisition of Petroamerica is highly strategic and will strengthen its position as the premier operator and land holder in the Putumayo Basin. Petroamerica’s undeveloped land holdings and exploration and development portfolio are highly complementary to Gran Tierra’s own exploration portfolio, strong cash flow, reserves base and balance sheet strength. With expected base pro forma production of 28,000 to 30,000 boe/d in 2016, Gran Tierra believes that the combined entity will be uniquely positioned as a high growth, well-capitalized, Colombia focused oil and gas producer with a dominant position in the Putumayo basin and a growing presence in the Llanos basin. In addition, Gran Tierra has the financial capacity to pursue additional exploration and development projects within Petroamerica’s asset portfolio. The successful completion of the Acquisition is expected to be accretive to Gran Tierra’s net asset value per share. Gran Tierra will remain debt free with pro forma working capital of $135 million to $210 million, depending on the form of consideration elected by Petroamerica shareholders. (3) Operating Netback and Operating Cash Flow – these are financial measures that do not have standardized meanings under generally accepted accounting principles in the United States of America (“GAAP”). Please refer to Disclaimer in this press release for more information about these non-GAAP measures. Brent Pricing of $50/bbl was estimated for the Estimated Annual Operating Cash Flow. 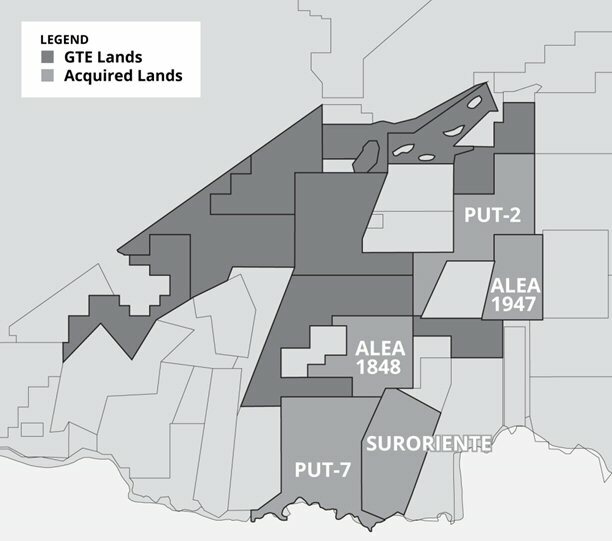 The Acquisition increases Gran Tierra’s position in its core area of Putumayo, including significant additional acreage in the emerging N Sands exploration play. This Acquisition is consistent with the Company’s strategy to efficiently grow its current exploration, development and production opportunity base within Colombia, while diversifying into the prolific Llanos and Magdalena Valley geologic basins. In the Company’s view it is paying a fair value for the existing reserves and production established by Petroamerica, while at the same time enhancing the combined growth portfolio for both Gran Tierra and Petroamerica shareholders. “The Acquisition is aligned with our strategy of consolidating efforts in our core area of the Putumayo basin where we have a solid land position and a strong operating team. Pro forma for the Acquisition, Gran Tierra will be a well-capitalized company with a well developed production base, free cash flow and a significant growth portfolio providing optionality to allocate capital between three major oil and gas producing basins in Colombia,” said Gary Guidry, President and CEO of Gran Tierra. “This Acquisition improves the long-term sustainability of our business model not only through diversification and per share growth, but also through the addition of high quality assets with significant growth potential. The low-cost, high-return assets add yet another layer of top-quartile locations to our expansive drilling inventory.” On a per share basis, the Acquisition is expected to be immediately accretive to Gran Tierra’s net asset value per share. Petroamerica has identified numerous prospects in its exploration portfolio, several of which we intend to drill in 2016. With Gran Tierra’s strong balance sheet and forecasted free cash flow generation in 2016, we expect to have the necessary funding to drill the identified prospects. “The Acquisition is beneficial to Gran Tierra as it provides the potential to strategically shift its exploration investment commitments from frontier to more proven hydrocarbon producing basins with established infrastructure and production sales”, commented Mr. Guidry. “Depending on commodity prices and the amount of capital we choose to spend, we believe the Petroamerica assets can contribute approximately 3,000 to 5,000 boe/d of production in 2016, over and above our organic growth plans,” said Guidry. The Acquisition continues to consolidate Gran Tierra’s Putumayo core area, which is expected to generate efficiencies and synergies in the Company’s consolidated operations and capital program in the area. Although Gran Tierra’s strategy is to control capital allocation and operating efficiencies through operatorship, the Company can also add significant value as an active joint venture partner. In addition to the new operated Petroamerica assets, Gran Tierra will look to capitalize on the opportunity to transfer its horizontal drilling, completions and waterflood expertise to the non-operated fields. Petroamerica established a special committee of its board of directors that was tasked to explore various transaction alternatives available to Petroamerica, including transactions similar in nature to the Acquisition. Upon receiving an offer from Gran Tierra that was unanimously recommended to the board of directors by the special committee, the board of directors amended the mandate of the special committee to negotiate the Acquistion. The special committee, determining that the Acquisition was in the best interest of Petroamerica’s shareholders, unanimously recommended the Acquisition to its board of directors. Upon recommendation of the special committee, the board of directors of Petroamerica, with the exception of one director who recused himself for potential conflict reasons but who unequivocally supports the transaction, has unanimously recommended approval of the Acquisition and has determined that the Acquisition is in the best interests of Petroamerica shareholders. In addition, Petroamerica’s sole financial advisor, Black Spruce Merchant Capital Corp., has provided the board of directors of Petroamerica with a verbal opinion that the consideration to be received by Petroamerica shareholders pursuant to the Acquisition is fair, from a financial point of view. Officers, directors and shareholders that collectively hold approximately 10.13% of the issued and outstanding Petroamerica shares have entered into voting support agreements and have agreed to vote their 11,032,858 securities in favour of the Acquisition. The Acquisition is subject to Petroamerica shareholder approval as well as customary regulatory, stock exchange, court and other approvals. The Acquisition provides for, among other things, a non-solicitation covenant on the part of Petroamerica, subject to customary “fiduciary out” provisions that entitle Petroamerica to consider and accept a superior proposal and gives Gran Tierra the right to match any superior proposal. The Arrangement Agreement provides for a mutual non-completion fee of US$5.0 million, payable in certain circumstances, including if Petroamerica enters into an agreement with respect to a superior proposal or if the board of directors of Petroamerica withdraws or modifies its recommendation with respect to the Acquisition. The Acquisition is expected to close on or about January 29, 2016. Full details of the Acquisition will be included in an information circular of Petroamerica to be mailed to Petroamerica shareholders in accordance with applicable securities laws. A copy of the aforementioned information circular and related documents will be filed under Petroamerica’s issuer profile on SEDAR at www.sedar.com at the applicable time. Gran Tierra continues to execute its business plan of creating sustainable value-added growth in reserves, production and cash flow through management’s integrated strategy of acquiring, exploring, developing and enhancing high-quality assets in Colombia. This press release contains opinions, forecasts, projections, and other statements about future events or results that constitute forward-looking statements within the meaning of the United States Private Securities Litigation Reform Act of 1995, Section 27A of the Securities Act of 1933, as amended, and Section 21E of the Securities Exchange Act of 1934, as amended, and financial outlook and forward looking information within the meaning of applicable Canadian securities laws (collectively, “forward-looking statements”). Such forward-looking statements include, but are not limited to, statements about: future projected or target production and the growth of production including the product mix of such production and expectations respecting production growth, 2016 forecasted production; our ability to grow in both the near and long term and the funding of our growth opportunities; our possible creation of new core areas; estimated reserves growth and estimated barrels of oil equivalent gross working interest in 2015 and 2016; our prospects and leads; estimated cash flow from operations; the plans, objectives, expectations and intentions of the company regarding production, exploration and exploration upside, development; Gran Tierra’s 2015 and 2016 capital program including the changes thereto along with the expected costs and the allocation of the capital program; Gran Tierra’s financial position and the future development of the company’s business. Statements respecting reserves and resources are forward-looking statements as they involve the implied assessment, based on estimates and assumptions, that the reserves and resources described exist in the quantities predicted or estimated and can be profitably produced in the future. Among the important factors that could cause actual results to differ materially from those indicated by the forward-looking statements in this press release are: risks relating to Gran Tierra’s ability to realize the anticipated benefits from the Acquisition; Gran Tierra’s operations are located in South America, and unexpected problems can arise due to guerilla activity; technical difficulties and operational difficulties may arise which impact the production, transport or sale of our products; geographic, political and weather conditions can impact the production, transport or sale of our products; the risk that current global economic and credit conditions may impact oil prices and oil consumption more than Gran Tierra currently predicts; the risk that unexpected delays and difficulties in developing currently owned properties may occur; the failure of exploratory drilling to result in commercial wells; unexpected delays due to the limited availability of drilling equipment and personnel; the risk that oil prices could continue to fall, or current global economic and credit market conditions may impact oil prices and oil consumption more than Gran Tierra currently predicts, which could cause Gran Tierra to further modify its strategy and capital spending program; and the risk factors detailed from time to time in Gran Tierra’s periodic reports filed with the Securities and Exchange Commission, including, without limitation, under the caption ” Risk Factors” in Gran Tierra’s Annual Report on Form 10-K filed March 2, 2015, and its Quarterly Report on Form 10-Q filed November 3, 2015.. These filings are available on the Web site maintained by the Securities and Exchange Commission at http://www.sec.gov and on SEDAR at www.sedar.com. Although the current capital spending program and long term strategy of Gran Tierra is based upon the current expectations of the management of Gran Tierra, should any one of a number of issues arise, Gran Tierra may find it necessary to alter its business strategy and/or capital spending program and there can be no assurance as at the date of this press release as to how those funds may be reallocated or strategy changed. BOE’s may be misleading particularly if used in isolation. A BOE conversion ratio of 6 thousand cubic feet of gas to 1 barrel of oil is based on an energy equivalency conversion method primarily applicable at the burner tip and does not represent a value equivalency at the wellhead. In addition, given that the value ratio based on the current price of oil as compared with natural gas is significantly different from the energy equivalent of six to one, utilizing a BOE conversion ratio of 6Mcf:1bbl would be misleading as an indication of value. The estimates of reserves and future net revenue for individual properties may not reflect the same confidence level as estimates of reserves and future net revenue for all properties due to the effects of aggregation. Possible reserves are those additional reserves that are less certain to be recovered than probable reserves. There is a 10% probability that the quantities actually recovered will equal or exceed the sum of proved plus probable plus possible reserves. All estimates of proved, probable and possible reserves and related future net revenue disclosed in this news release have been prepared in accordance with NI 51-101. Estimates of reserves and future net revenue made in accordance with NI 51-101 will differ from corresponding estimates prepared in accordance with applicable SEC rules and disclosure requirements of the U.S. Financial Accounting Standards Board (“FASB”), and those differences may be material. NI 51-101, for example, requires disclosure of reserves and related future net revenue estimates based on forecast prices and costs, whereas SEC and FASB standards require that reserves and related future net revenue be estimated using average prices for the previous 12 months. In addition, NI 51-101 permits the presentation of reserves estimates on a “company gross” basis, representing the Company’s working interest share before deduction of royalties, whereas SEC and FASB standards require the presentation of net reserve estimates after the deduction of royalties and similar payments. There are also differences in the technical reserves estimation standards applicable under NI 51-101 and, pursuant thereto, the Canadian Oil and Gas Evaluation Handbook, and those applicable under SEC and FASB requirements. In addition to being a reporting issuer in certain Canadian jurisdictions, Gran Tierra is a registrant with the SEC and subject to domestic issuer reporting requirements under U.S. federal securities law, including with respect to the disclosure of reserves and other oil and gas information in accordance with U.S. federal securities law and applicable SEC rules and regulations (collectively, “SEC requirements”). Disclosure of such information in accordance with SEC requirements is included in the Company’s Annual Report on Form 10-K and in other reports and materials filed with or furnished to the SEC and, as applicable, Canadian securities regulatory authorities. The SEC permits oil and gas companies that are subject to domestic issuer reporting requirements under U.S. federal securities law, in their filings with the SEC, to disclose only estimated proved, probable and possible reserves that meet the SEC’s definitions of such terms. Gran Tierra has disclosed estimated proved, probable and possible reserves in its filings with the SEC. In addition, Gran Tierra prepares its financial statements in accordance with United States generally accepted accounting principles, which require that the notes to its annual financial statements include supplementary disclosure in respect of the Company’s oil and gas activities, including estimates of its proved oil and gas reserves and a standardized measure of discounted future net cash flows relating to proved oil and gas reserve quantities. This supplementary financial statement disclosure is presented in accordance with FASB requirements, which align with corresponding SEC requirements concerning reserves estimation and reporting. White House spokesman Josh Earnest said Obama had sought to “shield this process from politics”, but the president’s many delays have only injected more politics and posturing into the national debate. Girling said during the conference call that while that process – which could take up to a year to complete – there was little reason for the State Department to move ahead. The Project: The 1,179-mile (1,900-km) Keystone XL pipeline would move 830,000 barrels per day of oil sands crude from Hardisty, Alberta, across the USA border to Steele City, Nebraska, where it would connect with a previously approved line. Experts on both sides of the border say there are both climate and political implications to TransCanada’s request for the State Department to pause its review of the pipeline permit. If granted by the US State Department, the delay would nearly certainly hand the decision for the long-delayed project to a future president rather than Barack Obama, a Democrat. In the seven years that Keystone XL has been under review by the State Department, political support for the project has waxed and waned. Supporters maintain it will create jobs and reduce US reliance on Middle Eastern oil. League of Conservation Voters Senior Vice President of Government Affairs Tiernan Sittenfeld said, “This is nothing more than another desperate and cynical attempt by TransCanada to build their dirty pipeline someday if they get a climate denier in the White House in 2017″. But she did indicate that State may be inclined to reject TransCanada and finish the review. The Keystone XL pipeline project was first proposed more than six years ago, but has languished, awaiting a permit required by the federal government because it would cross an global boundary. Facing pressure to act, former Gov. Dave Heineman convened a special legislative session in late 2011 to pass new pipeline regulations. Harper had been urging the United States to approve the 1900-kilometre pipeline. “It’s absolutely front and centre of any producer’s mind when they commit to a multi-billion dollar project”, said Sonny Mottahed, chief executive officer of boutique investment bank Black Spruce Merchant Capital, adding more projects could scrapped because of the Keystone XL delay. This afternoon the White House weighed in and President Obama still has the ability to kill the project, and apparently plans to make a decision before leaving office. The GOP presidential field is unanimous in its support for Keystone, while Obama has downplayed its benefits and emphasized environmental risks, setting up a high bar for approval. The company also has lost its most important domestic ally in the Keystone effort, Conservative Stephen Harper, who was ousted last month as Canada’s prime minister. But the $8 billion pipeline, which would enable crude oil from Canada’s oil sands to reach refineries and ports in the United States, isn’t dead yet. Asked whether he feared Obama would reject Keystone XL, Girling said bluntly: “No”. And TransCanada would be racing against the clock: Without sufficient pipelines in place, the low oil price is already squeezing oil sands production and forcing companies out of the game. Since Monday’s announcement by TransCanada, environmental groups and others are now pressing the Obama administration to outright reject that pipeline rather than agree to a suspension. TransCanada Corp TRP.TO TRP.N, Canada’s second-largest pipeline company, reported a better-than-expected quarterly profit, helped by higher earnings from its Keystone systems.